Las Vegas - The first Pinoy pugilist in the undercard of Manny Pacquiao’s fight against Adrien Broner lost by Unanimous Decision in an eight round lightweight match. Rey Perez, originally of Santa Rosa, Laguna but who is now training and fighting out of California, was defeated by points by Pacquiao’s sparring partner- George Kambosos Jr. 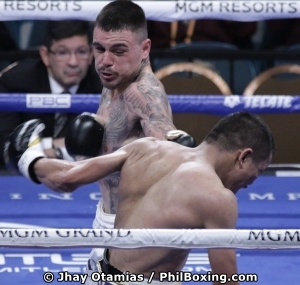 In a fight devoid of any meaningful and exciting action in the ring, Kambosos Jr. scored a shutout victory in the cards with scores of 80-72 from all three judges at ringside. Kambosos Jr. who is trained by Pacquiao’s strength coach Justin Fortune and with Freddie Roach in their corner was the more effective puncher of the two fighters. He was reliable with his counter punches and attacks against Perez who mounted no clear attack in the eight-rounder.